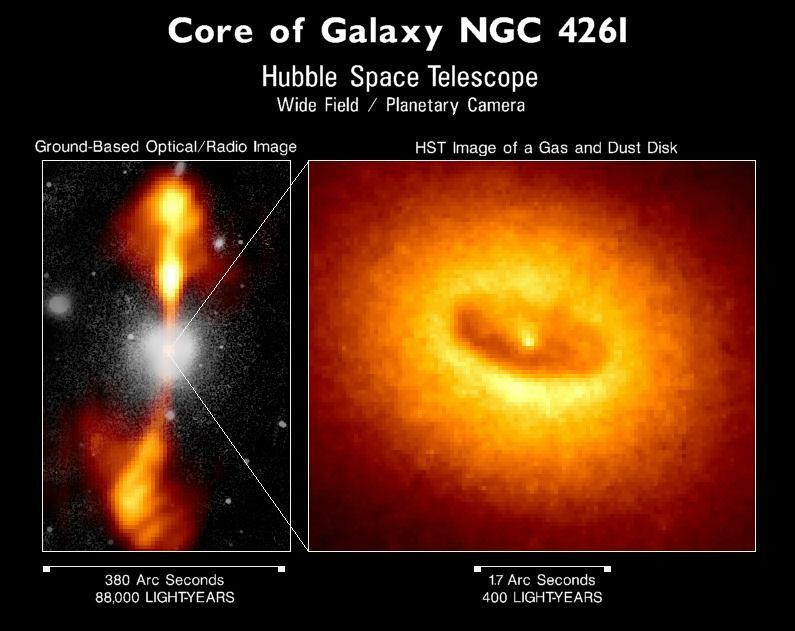 These observations and arguments all suggest that active galaxies are powered by material accreting onto a massive central black hole in the nuclei of galaxies. What does the nucleus look like? Accretion disk: hot, luminous gas accreting onto the black hole. Broad-line region: Gas clouds near the accretion disk, turbulent motions at high speed. Dusty torus: a ring of denser gas and dust surrounding the nucleus. Narrow-line clouds: Gas clouds further out, moving more slowly. To achieve the necessary luminosity, ~ 1-10 Msun/yr must be accreted onto the black hole. 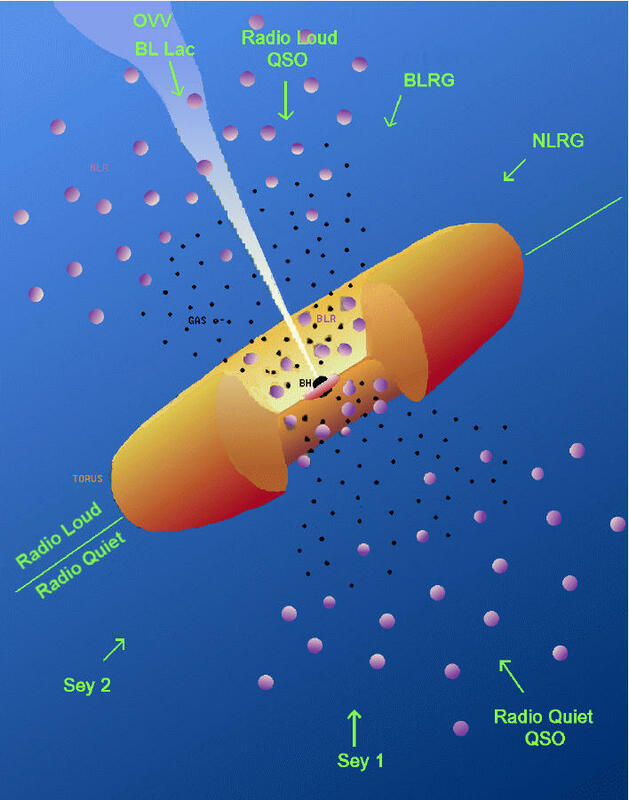 So Seyfert galaxies, radio galaxies, and quasars are similar objects -- accretion powered active nuclei. Real physical differences exist in things like total luminosity (quasars vs seyferts) or in radio power (seyferts vs quasars/radio galaxies) or in host galaxies (seyferts vs radio galaxies). Is there direct observational support for this? 1. What do the host galaxies of quasars look like? 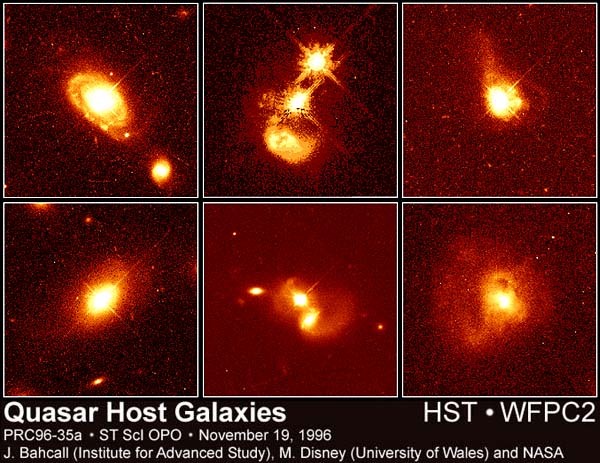 These disturbed hosts suggest that quasars form when galaxies are experiencing interactions or gravitational perturbations. 2. When were quasars most active? We can look at the distribution in redshift of quasars. They occur much more frequently at high redshift, meaning they are very far away, so we are seeing them as they were long ago. We are actually looking at the early universe. Quasars formed when the universe was young, probably coincident with the violence associated with galaxy formation. They quickly died out after that -- only a very few remain. Question: If quasars are associated with galaxy formation, what should we find in the centers of nearby galaxies?